Maaqtusiis High School has 79 students ranging from Grades 8 to 12. This year there are 17 students in Grade 12. In addition, there are 147 students at the elementary school ranging from Kindergarten to Grade 7. The morning belonged to the post-secondary representatives as they shared what their respective institutions have to offer. Camosun College launched an initiative called Strengthening our Connections. Alli Matchett of Camosun College described it as a network of educational institutions that tour together to deliver information about post-secondary education programs. Strengthening our Connections ensures that Aboriginal youth and adults interested in pursuing a post-secondary education have accurate and up-to-date information about post-secondary programs, admission, costs, scholarships, accommodation as well as resources and support services available to them. According to INAC statistics, two per cent of Aboriginal people on reservation between the ages of 20 and 24 hold degrees or diplomas. The number increases to four per cent for the 25 – 29 age group. “When we do our math, Ahousaht will be at 11 per cent if we achieve our goals in two years,” said Maaqtusiis teacher Jerry Perry. He was talking about the career aspirations of the present high school graduating class and how the school is working to prepare them for college and university. “We have six students with clear, driven career aspirations; they are doing the work outside the school to make it happen,” said Perry. Matthew Frank told the crowd he has two dogs and wants to be a veterinarian. Mark Frank-Perry wants to be a naval architect so he can work for the Canadian Coast Guard. “The students say they want to be pilots, blacksmiths, welders, chefs, photographers, journalists, mechanics, heavy equipment operators, teachers, computer programmers,” said Perry. School principal Kate Drexler said she is excited for the students to see what options they have after graduation. She said that at least four of her students are pursuing careers in medicine; two want to be veterinarians and the others wish to go into medical-care fields. These students are working on prerequisite courses that will help move them forward in their career aspirations. “We are offering them biology, physics, pre-calculus along with career counselling through our student services worker, Pam (Frank-Perry),” said Drexler. Perry talked about hands-on learning opportunities that are available in Ahousaht, thanks to the Applied Design Skills Technologies, a new course developed by the Ministry of Education that focuses on problem solving and engineering, featuring local content. This is a student-driven program that brings the students together to discuss the needs of the community and what is needed to meet those needs. Due to its isolation, Ahousaht people must be somewhat self-reliant in dealing with medical emergencies, since a trip to the hospital can take at least an hour from the time of the injury. Perry said the students met with their parents, elders and the local doctor to talk about the problem. As a result, they began a school-based first aid course with the goal of having someone trained in first aid in every household in Ahousaht. In order to achieve this, the students had to figure out what it takes to apply for funding and who to bring in that could offer certified training. They are learning skill sets that build capacity in the community. Perry said that they will begin offering St. John’s First Aid courses in May 2019 when the entire class is old enough to take part in the training. The Council of Eagles is another Maaqtusiis School initiative. Perry describes it as a council of students that problem solve by engaging the community. “We bring together the leaders, the community, our kids with people of influence that can make it happen,” said Perry. For instance, a dream of one of the students is to take part in the construction of an adult learning centre. Since one of the students wants to be an architect, they spoke to a professional architect about building design. “It helps them learn what it’s like in those professions,” said Perry. The students are also talking about the water problems in the village. “Right now they are looking at what they can do at home to address the problem,” Perry said. Deputy Chief Councillor Melinda Swan was there to encourage the students in their post-secondary dreams. She said that Elected Chief Greg Louie couldn’t be there that day because he was away, meeting with government officials to take care of band business. “It is important that students know the work we do as council members because we need you to fill our shoes someday. Each one of you has a gift and it’s up to you to nurture it and bring it to life. Today is an opportunity to think about your dreams and be inspired,” she told them. Swan went on to tell the class that Ahousaht has plenty of capital projects that need expertise and that the band must hire outside the community to fill that need. “We need engineers, biologists and we have to hire out,” she said. Participating post-secondary institutions included: Camosun College, the University of Victoria, Vancouver Island University, McGill University, Capilano University, Thompson Rivers University, and North Island College. 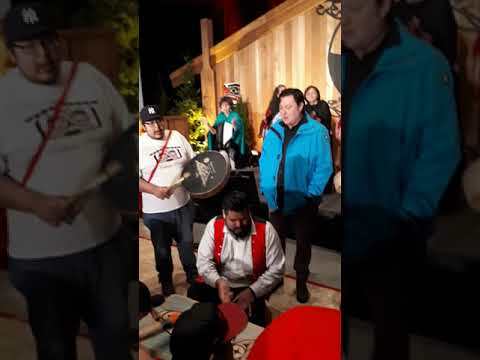 Employers included the Canadian Armed Forces, RCMP, Island Health, First Nations Health Authority, Canadian Coast Guard, NETP, NEDC, Maaqtusiis Hahoulthee Stewardship Society, Cermaq Canada, Ahousaht First Nations, Ahousaht Fisheries and OCN.